Whilst on our annual pilgrimage to Southwold on the bracing Suffolk coast I tried out a new salad recipe inspired by the cover recipe on this month’s Delicious magazine. It combines two of the season’s best ingredients – asparagus and baby new potatoes and adds to them crunchy radishes and a fresh herby dressing. The Delicious magazine recipe requires you to whip up a herb hollandaise sauce to dress the salad but creating a vinegar reduction, separating eggs and creating a delicate emulsion is not my idea of fun for a quick holiday lunch, and frankly, the idea of all that butter is a little off-putting. I replaced the herb hollandaise with a quick and easy yoghurt and herb dressing that worked really well with the other ingredients. At this time of year, Southwold’s greengrocer, the Crab Apple in the Market Place is heaving with local Seabreeze asparagus, so much so that one no longer feels the need to treat it reverentially. Wild fennel grows in abundance by the beach and a little of this thrown into the herb dressing adds a fresh aniseed flavour note that works well with the asparagus and potatoes. The genius part of this salad is that the potatoes are not just plain boiled but after a quick parboil are smashed and roasted in olive oil in a hot oven becoming deliciously crispy. In terms of aesthetics, the long thin white tipped Breakfast variety of radish look prettiest, especially if you leave on a little of the green radish top. If you can’t get hold of these then the regular scarlet globe-shaped type works just fine. Here’s the recipe. I’d recommend it to anyone wanting to pep up a holiday lunch and it provides welcome relief from yet another carb-heavy pork pie and sandwich picnic. Adapted from a recipe in the Delicious magazine May 2015 edition. Cook the potatoes in boiling salted water for 7-8 minutes until you can just pierce them with a knife point but they are not quite tender. Drain thoroughly and tip the potatoes onto the prepared roasting tin. Press each potato with a fork to squash it partially. Drizzle over the olive oil, season and toss lightly to coat. Slip the roasting tin into the oven and roast the potatoes for about 30 minutes, turning them half way through the cooking time. While the potatoes are in the oven, make the dressing. Put all the dressing ingredients into a medium bowl, stir to mix, cover and set aside in the fridge. Steam or boil the prepared asparagus until just tender – about 5 minutes for the plump spears shown in the photograph. Slice each asparagus spear into two halves carefully on the diagonal. When the potatoes are ready, tip them onto a platter and spread them out. 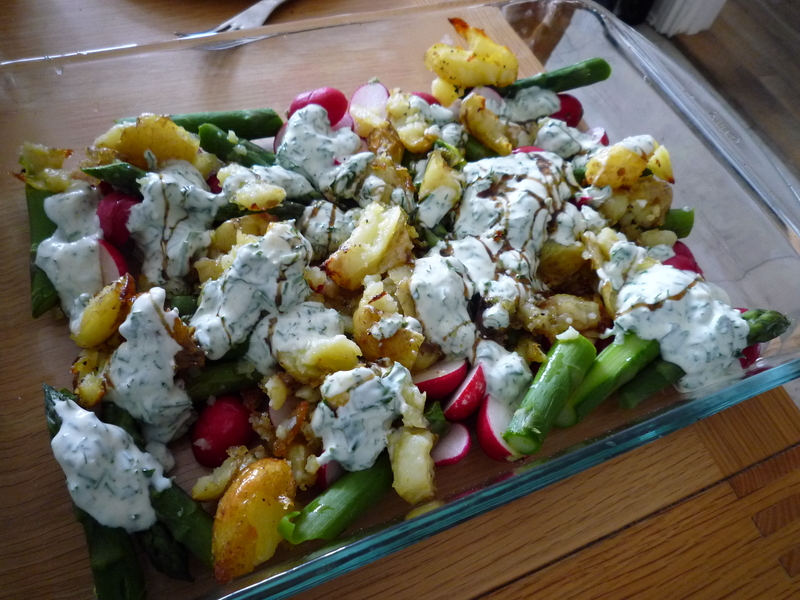 Scatter over the asparagus and then the radishes. Dollop the herbed yoghurt dressing over the salad and, if liked, scatter over a few chopped herbs and drizzle with just a little balsamic vinegar or pomegranate molasses. You are currently reading A summery salad from Southwold at The Rhubarb Fool.